I can barely contain myself, this episode has so much! An appearance by Matches Malone, a fluorescent colored batman, a super powered conceit, and a Lex Luthor that spells his name backward. Most importantly, the most legendary voice actor in the history of Batman animation makes an appearance. Read on for all the details. In the teaser we get Batman in his Matches Malone disguise, along with the Metal Men’s Dr. Magnus wearing a flamboyant garb complete with a large hat sporting a larger feather. I’m not sure what line of work Magnus is pretending to be in, but I assume it “ain’t easy”. The pair are disguised in order to obtain an audience with Kanjar Ro, and take him down. Ro figures out the ruse and calls in some henchmen, warning the duo that they are outnumbered. Ro doesn’t know the secret our heroes have up their sleeve (and in their mouth) as the Metal Men appear from various paraphernalia that our heros have with them. The coup de grace is when Magnus’ gold grill upon his teeth turns into the fist of Metal Man Gold and punches out the villain. Crazy stuff right? The story proper begins with Batman and his friendly rival, Green Arrow, battling some space pirates while simultaneously sharing subtle barbs about their respective space craft. Somehow a wormhole opens up in space and transports the Dark Knight to a far away planet. 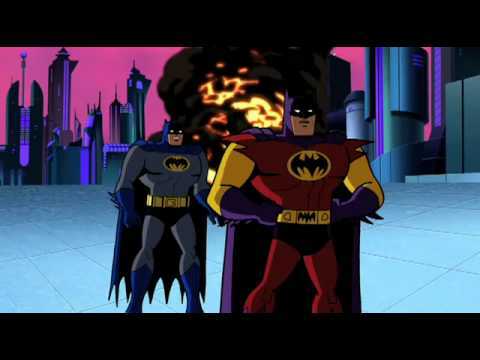 Batman is greeted by his interplanetary doppelganger who wears a garish and brightly colored Bat-suit, and is voiced by the legendary Kevin Conroy. This is followed by a lot of discovery / exposition about this new planet that is called Zur-En-Arhh, and the city Gothamopolis. The Batman of this world is the secret identity of a newspaper reporter named Tlano who works as a reporter for the city paper, and has a crush on a lady who is not unlike Lois Lane. By the way, Dana Delaney (the voice of Lois Lane in Superman: The Animated Series) is the voice of this totally not Lois Lane character. 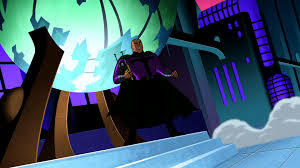 On this planet the major villain is a guy named Ruhtol (you know, Luthor spelled backwards – and voiced by Clancy Brown) a bald megalomaniacal genius whose weapon of choice are large spindly legged robots. These robots are easily defeated by tripping them up with cables attached to small flying machines, proving that The Empire Strikes Back must not exist in this world, or else Ruhtol would know how the AT-AT’s were defeated in the Battle of Hoth. The real twist about this story is that something about the atmosphere on Zur-En-Arhh give Batman (from Earth) all the powers of Superman, and leads him to continually upstage the local Batman. 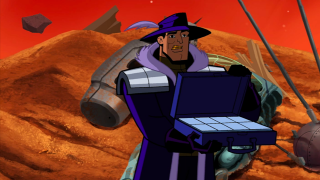 Tlano runs some investigations in his Batcave and discovers that an element called Rodon is the source of the Earthlings super powers, but Rothul also figures out the same thing, and the villain also figures out that Quartz is the equivalent to Kryptonite in this scenario. As Bats from Earth is dwindling under the effects of Quartz, Tlano comes to the rescue and reminds everyone why he is the hero of Zur-En-Arhh. He saves The Dark Knight by spraying him with a chemical that shields him from the effects of both Rodon and Quartz. After Ruthol and his robots are defeated, Green Arrow shows up in his space ship, giving Batman a ride home. 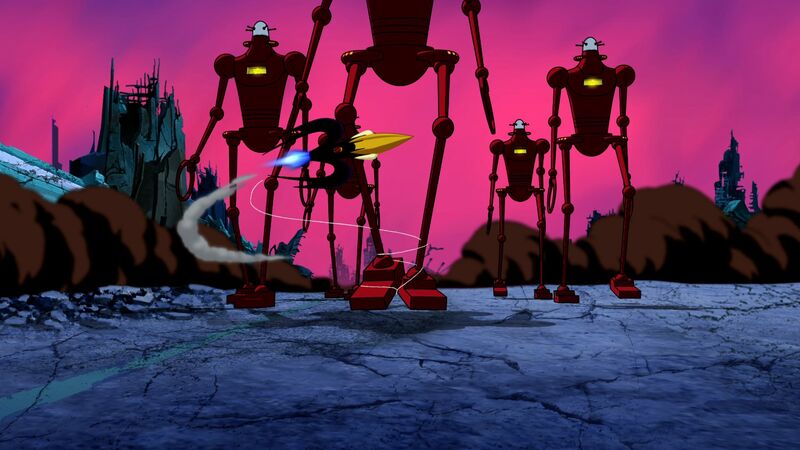 This episode is adapted from a Batman story written in 1958 titled “Batman – The Superman of Planet-X” and it does a wonderful job of retelling the original story while adding entertaining and interesting new elements. The garishly costumed local Batman is depicted exactly as he was in the comics story, and the choice of Kevin Conroy to voice him was superb. This is a great story to familiarize peoplee with the kind of post Golden Age, yet pre-Silver Age stories that were being told in Batman, and the voice casting was a nostalgic treat (Conroy, Delaney, Brown) for die hard fans of the Bruce Timm era. This show may seem a little ridiculous to some, but for others it is a treat, even if it is little more than an indulgence.